Most of us believe that hair loss is just an unfortunate part of growing older, and a male dominated condition – which is why hair loss for young women can be so shocking. Unfortunately, hair loss can strike any of us, and can start at any age. It is important to know the specific form of hair loss you may have in order to get a fighting chance at its reversal. Androgenic Alopecia: Androgenic alopecia is more commonly known as pattern hair loss. It is usually associated with men, but it works in the same way for women; an excess of a hormone named dihydrotestosterone (DHT), which binds to follicles and causes them to shrink. It is genetic in nature, and is irreversible. Female Alopecia Areata: Alopecia areata is characterised as an autoimmune disorder that causes sudden and patchy hair loss. If caught early, the skin can be treated and hair can grow back. Female Traction Alopecia: Traction alopecia is caused by the excessive styling and pulling on hair, which can traumatise the follicles and cause them to close prematurely. Hairstyles like braids or tight ponytails are often to blame. Telogen Effluvium: Hair loss caused by an extreme physical or emotional shock, affecting your immune system, hormonal levels and metabolism – all of which affect the hair follicles. This form of hair loss is particularly common for women who have given birth, affecting up to half of women post-pregnancy. 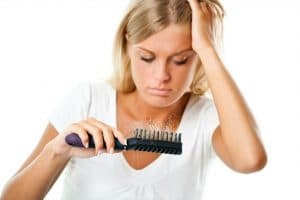 Iron Deficiency Hair Loss: A temporary form of hair loss resulting from a lack of iron in the body, especially for heavily menstruating women. Hair is incredibly important for women; losing hair can result in feelings of sadness, anxiety, embarrassment or shame. If these feelings begin to take a hold of your life, any form of treatment that can restore your appearance should be seriously considered. Although treatment will depend on the exact cause of your hair loss (Advanced Hair Studio’s complimentary hair check can help you get to the root cause), there are steps you can take to alleviate the effects. A good diet, appropriate skincare routine and rest will help your skin to recover from infections or autoimmune disorders. Otherwise, promising results have been achieved through the use of thickening treatments, PRP stem cell interventions and low level laser therapy. Minoxidil has been shown to be just as effective for women as it is for men, provided it is prescribed before significant hair loss has taken place. In cases of permanent or irreversible hair loss, female hair transplant procedures are always an effective and reliable treatment that will help natural, thick and luscious hair to grow back in place – Advanced Hair Studios has developed a technique specifically to replicate the unique look and texture of hair, both surgical and non-surgical.